The tension between Japan and China are increasing. Japan displeases China when Chinese nuclear submarine infiltrate Japan sea territory. Chinese government also protests against the co-operation between Japan and United State in an attempt to enclose China, especially the construct of missile defense and intercept system called “Theater-range ballistic missile defense (TMD)”. As a result of TMD, China is willing to do everything to stop Japan to become one of the permanent members of United Nations Security Council; UNSC. From this high tension, Japan has to change its defense policy. During the Koizumi’s government there was also a challenge to change. The government passes a bill to allow JSDF to join in United Nation humanitarian operation but not in combat area. Now many JSDF officers are deployed for peace keeping operation as request by United Nation. 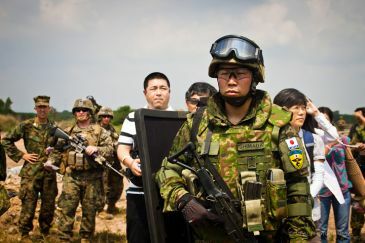 It is a part of promoting the capability of JSDF to the World level and a plan to searching for more allies who could provide help in defending Japan territory. On the other hand, this is also an attempt to show the necessity to change Japanese constitution. Despite that Japan cannot send its troops into combat zone but to United Nation Japan’s aid is so important. JSDF could provide transportation, construction, disaster relieve and medical service to people in need. There were many times that Japan provides its helps in Afghanistan, Iraq and Sudan. Aid and relieve are far much better than combat assist. Japan also donates huge amount of money to support various United Nation operations. It will be a lot more difficult for the peace keeper forces to achieve their goal. When Japan wants to increase its military action, shall United State concern about this. United State still believes in its far superior forces. Plus Japan right now is more concern about its economic stability. This economic policy clearly contradicts to the idea of expanding its forces. Furthermore, United State has spent a lot of its budget to protect Japan since the end of World War II. It could be a better for United State to reduce its military cost when its economic is uncertain and not in a great shape. Not only burden that United State has to shoulder but there are also objection from citizens around United State base in Japan. The change in Japan’s military policy to depend on itself more might be great option for these two countries who bound together. Japan could get better and more flexible defense while United State still gains influence over Japan with less cost.